Vietnam has been attracting attention as an emerging country. As its economic growth continues, the challenges it faces in the health sector have also changed considerably. In recent years, the country’s health sector has faced a variety of issues including creating a more efficient and sustainable medical care system and improving the quality of medical services. 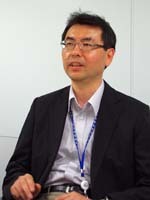 Kitaki assumed his current post after working at the Cabinet Office’s Economic and Social Research Institute. He specializes in macroeconomics, applied econometrics, health economics, and public economics. - What is the purpose of this research? In low-income countries, a typical challenge in health and medical care is the provision of maternal and child health care and infectious-disease prevention. However, as these countries' economies grow, the number of non-infectious diseases, such as lifestyle diseases, tends to rise. These diseases account for a large portion of the total number of deaths in low-income countries, making the situation similar to that in Japan and other developed countries. When that happens, the medical-care system needs to respond differently from the way it does with maternal and child care and infectious-disease prevention. Vietnam is approaching that phase now. The study aims to measure the efficiency of public and private hospitals at the provincial and district level in six provinces and cities, including large cities such as Hanoi and Ho Chi Minh City and their surrounding provinces. It also aims to analyze the factors that cause variances in efficiency. For instance, I will identify the distribution of efficiencies among these hospitals, and determine if the type of hospital possibly affects the level of efficiency among hospitals. The provision of medical services requires not only doctors, nurses, and pharmacists, but also the investment of resources such as beds, machinery and equipment, and diagnostic devices. If all hospitals have the same resources, then a hospital that treats a large number of patients will be more efficient. Naturally, we should pay attention to the quality of the care provided. - What led you to come up with the idea for this study? Normally, when per capita income rises, the amount spent per person on medical care also increases. This natural phenomenon arises because of an expansion of the resources that can be allocated to medical care. However, from the perspective of efficiency, two problems beset Vietnam's medical-care system. The first is crowding at large hospitals. Public hospitals in Vietnam are organized in a hierarchical structure, and categorized into three hospital types: central, provincial and district hospitals. Most Vietnamese appear to place greater trust in large hospitals than in small local hospitals. You would think that getting treated immediately at a local hospital would be preferable to the three- or four-hour waits that are often seen at large hospitals. However, the fact is that patients tend to flock to large provincial central hospitals. This means that resources such as personnel and funds have to be invested in the large hospitals first; but if that happens, the small local hospitals can never improve. Although the notion that they "cannot be trusted" is misguided, the end result is a vicious cycle whereby this false impression actually becomes reality. The other challenge is the marketization of medical services. Reform of the medical care system in Vietnam has led to the introduction of public health insurance, enabling public hospitals to collect medical costs from patients. As the number of patients visiting a hospital for treatment rises, the revenues earned by the hospital will also increase. In addition, while in the past most of the medical institutions providing medical services were public hospitals, in recent years there has been a significant increase in the number of private hospitals, particularly in cities. Of the approximately 1,200 hospitals in the country, more than 10 percent are private. And because private hospitals are obviously run for profit, competition inevitably arises. In other words, medical services are gradually becoming more market oriented. However, there have been no rigorous studies or evaluations carried out on the impact of the marketization of hospitals in Vietnam. - What is your research method and what challenges have you faced? One of the methods I have adopted is DEA (Data Envelopment Analysis). The ratio of the resources invested (inputs) is compared with the products (outputs) to estimate the envelope (a set of input-output combinations where efficient production is realized), and the distance between each hospital and the envelope is measured. The farther away a hospital is from the envelope, the less efficient it is. I use this method to measure the efficiency of the hospitals I surveyed in my research. There are certain studies that use DEA to measure the efficiency of hospitals; however, in the case of Vietnam, that method has only been used for certain types of hospitals, such as private hospitals and large public hospitals, or provincial and central hospitals. As far as I know, district hospitals, which are one of the subjects of this research, have never been measured. The difficulty in conducting this research is to collect data. First, I visited the hospitals and asked them to provide the data I required. Specifically, I requested three years of data comprising the types of hospitals, input and output - such as the number of inpatient admissions, the number of inpatient discharges, and the number of outpatient physician visits - and a breakdown of their age and gender. I also asked for such information as the number of doctors, nurses, and beds. I thought this was fairly basic data for a hospital to maintain, but I found that some hospitals could not provide me with part of the data I required because they didn't have it. 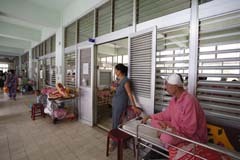 Another challenge is the unique nature of the Vietnamese medical-care system, which is very complex. In Japan, for example, you basically pay 30 percent of the costs for yourself, whichever hospital you go to. In Vietnam, though, the proportion that the patient has to pay differs depending on the patient's attributes, the type of hospital and the type of treatment. Without adequate information, it is hard to understand the complex medical system. However, unless you understand that, you cannot examine the various factors that are hidden in the background of efficiency. Officials from Vietnam's Ministry of Health are keen to offer efficient and effective medical services. Although my study covers six provinces and cities, those officials said they would like an analysis of the whole country. - What do you expect to reveal about policy in developing countries and international assistance in the future findings of your research? In regard to medical care policy issues in developing countries, there is a concept called universal health coverage (UHC). The approach of having every citizen enroll in an insurance scheme is also based on UHC. Universal care is extremely important. However, medical care functions as a system with patients, hospitals and the government serving as consumers, providers and the regulating authority, respectively. I think it is necessary to come up with a method by which medical services function well as a system in order to achieve UHC. In other words, it is necessary to make the most of resources available to provide effective medical care and meet patient demand. The perspective of efficiency will be important while viewing the medical care system as a whole. When I say the word "efficiency," some people may imagine it is about stripping away inefficiencies. However, efficiency as defined in economics is about producing the most goods and services for the greatest number of people from the same amount of resources. For example, suppose there are two hospitals, A and B. Hospital A has 100 doctors and treats 100 patients, while Hospital B has 50 doctors and treats 100 patients. Assuming there is no difference in the quality of the medical care provided, anyone can see that Hospital B is more efficient. In this situation, Hospital A could adopt Hospital B's management approach in an effort to provide more patients with medical services. This is an efficiency-enhancing way of thinking. Simply dismissing 50 of the doctors at Hospital A would never be considered. "Efficiency" is a word that is apt to be misunderstood, so I think it needs to be explained carefully. Nowadays, the nature of public services such as medical care and education has become an issue, and this is not the case only in developing countries. Measuring the productivity and efficiency of such services is extremely important for the formation of policy. I am committed to carrying out various types of research in such fields. - How do you view the relationship between “quality growth” and medical care or this research? The Development Cooperation Charter the Japanese government approved in 2015 stipulates the importance of "quality growth," that is, inclusive, resilient and sustainable growth. JICA-RI considers that innovation plays an important role in achieving this "quality growth." My research is associated with each of these aspects. For example, the improvement of medical care as a universal service would contribute to the inclusiveness of "quality growth." Meanwhile, establishing a medical care system as a social safety net can also deliver resilience. In addition, unless sustainability is ensured to maintain the medical care system, it will not be possible to gain people's trust. Medical care must offer the three elements of inclusiveness, resilience and sustainability, and it should pursue these elements. Medical care is all about innovation. People who could not have been saved in the past can now survive thanks to new medical treatment; this is an example of innovation. After their rehabilitation, they can once again be active members of society. That is why I think it is worth spending money on medical care.